The Tennessee Economic Development Council states, “… we think the quality of life should be high and the cost of living should be low…” and there does seem to be evidence to back up that belief. Tennessee has the fifth-lowest cost of living and some of the lowest housing prices in the country. And adding to that great quality of life, Tennesseans can boast music icons Elvis Presley and Dolly Parton for Graceland and Dollywood respectively. These tourist attractions and others mean that Tennessee ranks in the Top Ten US travel destinations. In 2014, a record 100 million visitors came and spent $17.7 billion within the state. This increased tourism-related jobs 2.8 percent to 152,900. While the numbers may make it look like all Tennessee residents are doing well, that’s not the case for everyone. Many residents are in debt and struggling to keep up. If you’re dealing with mounting debt, it may be time to look into debt resolution strategies. If you want to get out of high-interest debt, consolidating your debt with a personal loan could be a smart choice. And since this type of loan simplifies your payment schedule into one predictable payment each month, it could even help you stay on top of managing your finances. But your ideal debt-clearing solution depends on several factors, including the type of debt you have, the amount of debt, and what kind of time frame you’re looking to resolve it in. Debt consolidation loans are a popular solution for many residents of Tennessee. These loans can be used to consolidate debt from credit cards and other sources like medical bills or student loans. They can come from various places like a personal loan from a traditional bank or reputable debt consolidation company. A healthy debt-to-income (DTI) ratio. The debt-to-income ratio means that if the amount you owe is too high compared to the amount you earn, your DTI won’t be considered healthy. If you’re carrying too much debt in relation to what you’re earning, lenders may be wary of giving you a loan. If that’s the case, you should consider one of the other options available like a debt management program. There’s a lot of confusing information and disreputable companies out there so it’s important to have all the details at hand before you embark on your journey to financial freedom. It’s important to use the right strategy and the right lender. Visit Freedom Debt Relief or call 800-910-0065 for a free debt evaluation. Our Certified Debt Consultants will consider the specific details of your situation and recommend the best solution for you. In fact, our employees are so committed to helping you, if our programs don’t work for you, they’ll even recommend other companies that may suit you better! 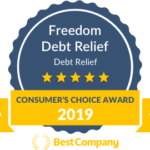 Our goal at Freedom Debt Relief is to help you deal with your debt once and for all—regardless of the method or who’s offering it. The statute of limitations in Tennessee is six years for contract disputes and debt collection claims. The countdown begins from when the debt first became overdue or when a you made your last payment—whichever was the more recent. After six years, the creditor can no longer sue you. This is one way to deal with your debt, but not the easiest.